On Monday night, a group of 15 nursing students battled it out in the cold to help bring awareness to a problem that is seen in Bemidji—homelessness. The nursing students came dressed for the cold weather from head to toe. Each was prepared with blankets, sleeping bags, tents, and food when 6 pm arrived. The lower union was open for them to use, it became a shelter when the outside became unbearable. People went inside to warm up with homemade soup and hot chocolate. Those who become homeless do not have the necessary means to be prepared for winter. They cannot afford to have the right clothing or know where to go for shelter. This forces them to use extreme measures to avoid freezing to death, especially since winter came early this year. There was a case in the past where homeless person died because of the extreme weather in Bemidji, but many people did not hear about it in the media. The nursing students felt like they were cheating, because homeless people do not have many supplies for their harsh environment during the winter. They do not have access to shelters in the winter because they become filled fast, and some do not know about them either. Sleeping outside is often the only option. These students were passionate about the problem of homelessness. Some students shared with the group their personal experiences homeless people. Interactions with the homeless can shape the way people see the world in a new light. Some students knew how it could be hard for the homeless to seek help and find shelter in the winter months. Ann Robertson, senior at BSU, talked about how you could see a person on a regular basis and know them well, but still not know what they are going through—they could be homeless. 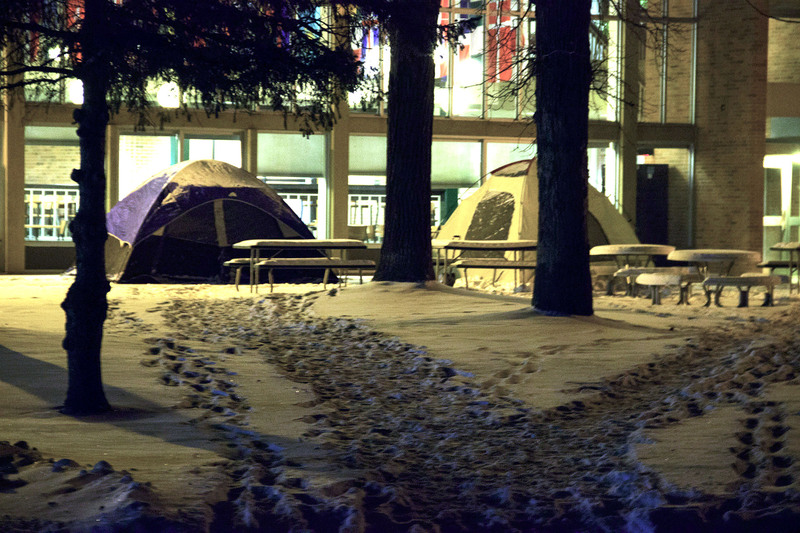 Even though these students were outside not only to understand how the homeless feel when darkness hits early this time of year, but they were also camping out for 10 hours in order to collect service hours for their nursing practicum. Some just wanted to get their hours done, but that did not diminish the experience of living as a homeless person. Some of the nursing students left as the night dragged on; minutes felt like hours. The nursing students had their phones with them to stay entertained. The phones later became devices to count down how many hours were left until the experience was over. The night was filled with laughter. The fire was started, and the students huddled by it in search of warmth and the comfort of friends. They were in good spirits as the night went on as people played card games before crawling into their tents for the night. The students there felt the experience of being homeless in Bemidji during the cold winter months; it became a nuisance. As the night approached, many decided to seek shelter in the tents. While people were in their tents that night it became real—homeless people go through this every day. “They are all around us, and we don’t know what they are going through. Some don’t like to beg. They are not your typical man or woman holding a sign seeking help,” said Robertson who understands that living as a homeless person is a problem that many do not truly understand.